It must seem cheeky to express disappointment in someone as famous as evolutionary biologist Richard Dawkins—coiner of the word “meme” and author of The Selfish Gene and The God Delusion—but I must. Although its subtitle promises to reveal “The making of a scientist,” the book delivers nothing close to an understanding of how a high–born boy from colonial Kenya came to be the popular scientist that Dr. Dawkins came to be, not only in Britain but the world. The book is doubly disappointing given the high regard many readers have for the depth of his intellect. Whom to blame—Dr. Dawkins, his editors, or both? The book conflates genres of memoir and autobiography while succeeding as neither. The material reads as a résumé desperately in need of an editor to give it shape and find its narrative thread. At the end I had no understanding of either the man or the notable scientist he became. Eminent persons typically write autobiographies that follow a chronological retelling of the life. Memoir, on the other hand, demands that the author inhabit two personae, the self now reflecting on the self then. By interrogating memory and material facts it aims to illuminate what is hidden in order to get to the meaning—of episodes, relationships, choices, and, ultimately, the life itself. The main fault lies is its mere chronicling—“and then, and then, and then. . . .” Everything is given equal weight. There is no compression of time for what matters little, nor slowing down for those moments of change that unalterably alter life’s trajectory. The result is no character arc or development, no getting at the meaning of events that a consequential life is about if it is to mean anything to the rest of us. Taking up perhaps a third of the book, extensive block quotations undermine the authorial voice and its authority to tell a story. Dr. Dawkins quotes secondhand sources extensively, such as favorite poetry and popular songs of the time, and especially lengthy extracts from family papers. The effect is that of two narrators, constantly interrupting one another. Dr. Dawkins has a knack for going off topic. The chapter on Berkeley where he had a two–year stint teaching animal behavior recounts instead his political activism against Vietnam and Senator Eugene McCarthy. Amid such tangents comes the first attempt at introspection: “I try to peer into my own state of mind in my twenties in Berkeley as honestly as I can.” Yet he does not peer; he retreats to quoting the poet Wordsworth rather than give the reader his own thoughts. Would that there were more glimpses into the scientist’s mind. Would that his editors had tutored him to interrogate the events he so meticulously chronicles and plumb memory for insights in the present. 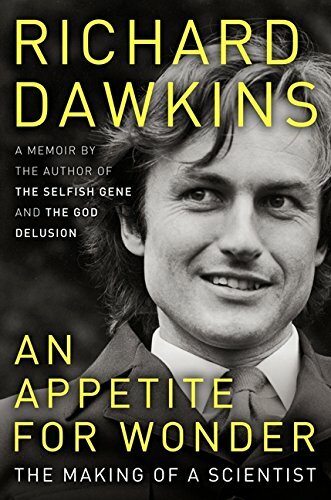 Where he cannot recollect or had to rely on family stories he could have asked, “Why don’t I remember?” or “What must I have felt?” These techniques, second nature for writers of literary nonfiction, would have been more fruitful in revealing Dr. Dawkins’ mind than the secondhand sources he provides. There is evidently a connection in Dr. Dawkins’s mind, but he does not pause to introspect what the experience means to him now and how it shaped him as an adult, if it did. One section stands out: his study with the animal ethologist Niko Tinbergen at Oxford. This thread has movement in that Tinbergen reappears later on in the story. Yet the momentum fades and author Dawkins reverts to chronicling. On his return years later to teach at Oxford he gives copious details about the computer programs he is tinkering with; none on his own musings. A page of logic statements used to illustrate his research on “hierarchically organized behavior” make the eyes glaze over. The diagrams, tables, and formulas are equally heavy going. The misnamed “Reflection” chapter at the end poses a series of quotidian questions. “What if I hadn’t done X?” His answer, “I don’t know.” It is the echo of his assessment on whether his boyhood in Africa influenced him as scientist: “The answer is no.” That, regrettably, is also the verdict on this book.